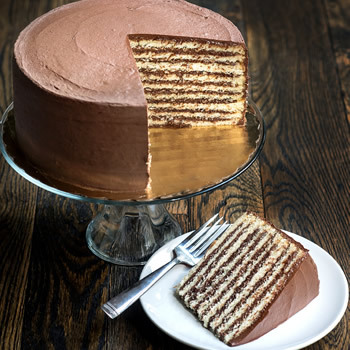 Enjoy the Cake that Launched a Thousand Ships!™ The Original Chocolate Smith Island Cake is by far our most popular offering, and is Maryland's State Dessert. Each cake is made from scratch, comprises layers of moist yellow cake and our homemade fudge frosting, is approx. 9" in diameter and 3.5" tall, and yields 14-16 slices. Like all SIBC products, it is shipped frozen with dry ice in a recyclable cake box.